Watch full One Piece Season 14 Episode 56 English Dubbed full HD online. One Piece Episode 514 English Dubbed online for free in HD. Living through Hell! Sanji’s Fight for His Manhood! On Weatheria, Nami is cornered by the scientists again. However, the navigator apologizes and takes off her shoes before luring the scientists to the edge of a cliff, allowing Nami to stay on the island. Nami requests Haredas to teach her the weather of the New World, as she wants to help Luffy on his journey to become King of the Pirates. The navigator also requests that she will use the Weather Balls as weapons. Meanwhile, on Kurakiri Island, the Marines investigate the lab’s destruction. Franky learns about Vegapunk’s inventions and uses a tiger mat as a cover for his head. Franky tells his friends about his dream and decides to help his captain by acquiring new skills learned from Dr. Vegapunk’s inventions. When his mat is burned, the shipwright scares off the Marines. On Kamabakka Kingdom, Sanji learns from Ivankov that eating helps his body to become aggressive. Despite Ivankov’s refusal to teach the dish of aggression, Sanji declines his offer to use Newkama Kempo, as he is a man who likes ladies. 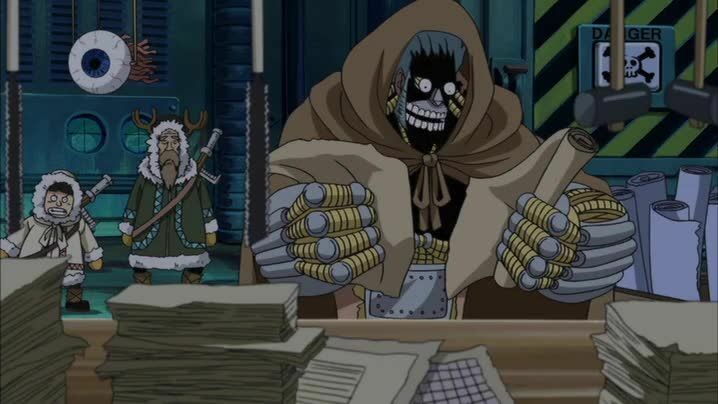 Ivankov offers to teach Sanji the ways of newkama cooking if he can gather 99 recipes from around the kingdom and retain his manhood while doing so. Sanji finally accepts Ivankov’s offer and proceeds to fight the Newkamas.